It was the first project we developed in the frame-work of zeitgenossen.com. The central idea was to combine web-specific art and media theory. This went along with the intention to describe our present. Formally we worked on the synchronicity of image and sound, the construction of depth perception and the ”menu-free” screen. The different fields were audio-visually merged and the resulting surface became part of an overall concept. At that point we got the idea of a specially generated dramaturgy of information for the World Wide Web. This concept was then further developed over the years and we came to the conclusion that it is the construction of coherent actions that provides sensuality and suspense. The surface got much attention and the main question was, how to create a maximum on sensual use. 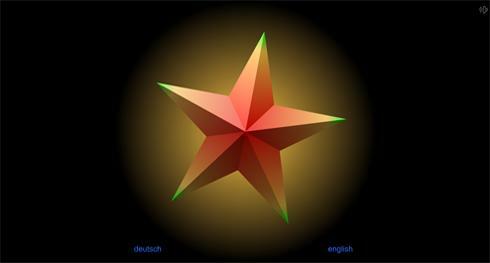 We generated the ”Star”, which, as long as it is closed, maximises the screen optically, which gives the projects the appropriate space.